Pick up just about any travel guide on Cairo, and you'll read about horrendous traffic, poor air quality, poverty and an unrelenting assault on the senses that can send the unprepared traveler into orbit. The guides have it right. As cities go, Cairo is a tough customer. And the various strikes and protests that have continued since the country's January 2011 revolution -- some of them violent -- have made life in the Egyptian capital even more unpredictable. But it's also a place with unique appeal. As a tourist destination, Cairo is known as the gateway to the legendary Pyramids of Giza and the Sphinx, fixtures in our psyche. But there are also mosques that are architectural masterpieces, still-inhabited neighborhoods that evoke thoughts of ancient Egypt, churches that date back to the beginning of Christendom, one of the largest bazaars in the world and, of course, the mighty Nile river. Cairo traces its origins back to the Egyptian capital of Memphis, believed to have been founded in the fourth century B.C. Today, with a population of 16 million, it's both bustling and chaotic, but there are places to find respite, such as leafy Zemalek Island and the Citadel, the largest fortification in the Islamic world, which has dominated Cairo's skyline since 1176. From the Mohammed Ali Mosque at the fortress, you'll encounter views of the sand-colored city that bring to mind storybook Egypt. As a man notes in a tale from "One Thousand and One Nights," "He who has not seen Cairo has not seen the world." Because it is often treated as a pass-through to the Pyramids and Nile River cruises, most travelers don't linger in Cairo -- except, perhaps, to take a perfunctory look at the Egyptian Museum of Antiquities' world-class collection of treasures or to take a curious look at Tahrir Square, where 2011's Arab Spring arguably began. And that's too bad, because this is a city that deserves far more than a fleeting first impression. 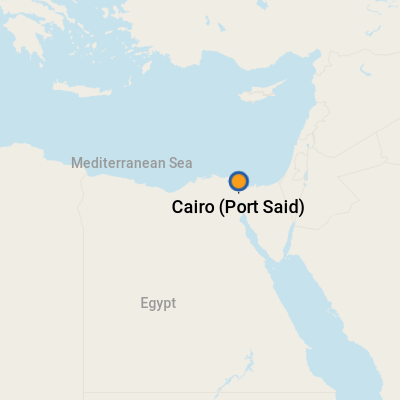 Mediterranean cruise ships dock in Alexandria and Port Said, each about a 2.5-hour drive from Cairo. 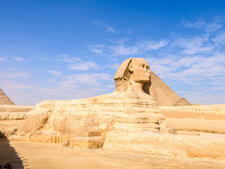 Shore excursions to Cairo from both ports are routine. Many ships drop passengers off at one port and then pick them up the next day at the next, allowing for an overnight in Cairo. 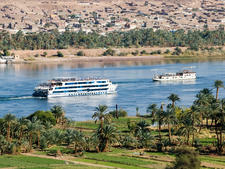 Cairo also serves as the port of entry for Nile River cruises, which operate strictly between Luxor and Aswan. Passengers frequently overnight for one or more days in Cairo before taking the short flight to Luxor or Aswan meet their ships. In Alexandria, ships dock right at the passenger marine terminal, home to all manner of souvenir stands, as well as a queue of bright blue taxis. (It's about a 10-minute drive to the Corniche, the city's waterfront boulevard.) Set a price with your driver up front before you get in. The port itself is pretty buttoned down, and you'll need your passport to exit. Egypt does require a visa, which is handled in advance onboard. If there is time, Alexandria -- the aptly named "Pearl of the Mediterranean" -- is definitely worth exploring. Don't miss the fabulous Bibliotheca Alexandrina. Opened in 2002, the beautifully styled library, with space for eight million books, was inspired by a library built there in the 3rd century B.C. In its day, it was considered the greatest library of all time, a magnet for the world's intelligentsia. The new library, designed as a sun rising out of the Mediterranean, is believed to have been built on the site of its ancient predecessor. First, the currency. Unscrupulous vendors may try to give you piaster notes instead of (Egyptian) pounds when making change. The bills look quite similar, so get familiar with them before going on a spending spree. Also, Egyptian vendors are notoriously aggressive. Don't give them money until you've agreed upon a price and have your purchase in your hand. Since Egypt is a Muslim culture, it's wise to dress appropriately in more traditional areas and mosques. Women should take care to cover their upper arms, cleavage, midriff and legs when visiting a mosque. A hair covering isn't necessary. Except in tourist resorts, modesty is the best policy, or women may attract unwanted attention. As for staying healthy, don't drink the tap water in Cairo -- even at the best hotels. It's also a good idea to avoid raw vegetables, fruit without peels and street food. Finally, always have change on hand. Baksheesh is the word for tipping -- and it is a way of life there. Expect to tip toilet attendants 1 L.E. or, possibly, be denied use of the facility. Taxis tend to be the preferred mode of transportation for foreign visitors. Hotel taxis are more expensive than the black and white cabs that are hailed on the street. Some taxis have meters; if the one in your cab works, this is the cheapest option. Otherwise, set a price before you get in, and don't pay until you arrive at your destination. However, don't haggle, or you'll never get to where you're going. If you don't like the price, take the next taxi. Fares are paid in cash, and most drivers accept Egyptian pounds, dollars or euros (though your change will come back in Egyptian). It's not unusual to ask the driver to meet you at an appointed hour and place for the return trip. Ask your hotel concierge or tour guide about average prices. Also, it is common practice for taxis to pick up extra passengers traveling in the same direction, so don't be alarmed if your group grows. Egypt is still largely a cash economy, though credit cards are widely accepted in finer stores, restaurants and hotels. Vendors will take American dollars, euros and Egyptian pounds interchangeably (although your change will come back in Egyptian currency). ATM's tend to be the least expensive way to obtain local currency. Note: Try not to have any Egyptian money left at the end of your stay, as you cannot exchange it outside of Egypt. Egyptians speak Arabic, but you'll find that most people involved in the tourism industry know English. Egyptian cuisine depends heavily on fresh ingredients -- herbs, spices, garlic, lemon, vegetables -- and its two staples are fava beans and aish, the national bread that's a mixture of plain and whole meal flour and looks like a darker, round version of pita bread. 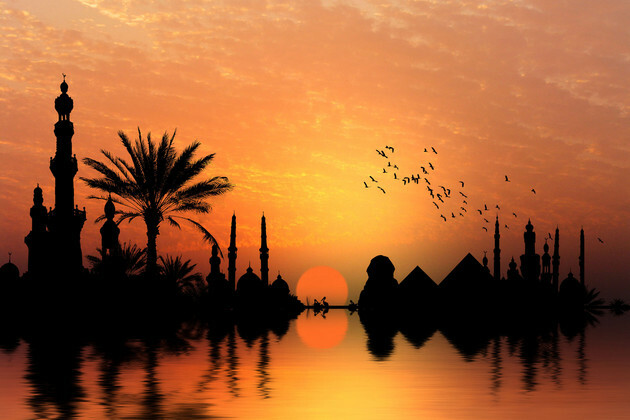 You can sample the cuisine in one of Cairo's many restaurants, although the better ones are in Garden City, Zemalek Island and other affluent areas of town. If you're worried about your stomach, stick to indoor places that draw large crowds instead of eating from stands or stalls. Egypt is a country that lives on tips; you'll find yourself making small baksheesh payments to everyone from the man who hands you a flashlight at the pyramids to the woman who guards the public toilets. In restaurants, you'll want to tip between 10 and 15 percent. The Garden Promenade Cafe at the Cairo Marriott on Zemalek Island is a favorite of wealthy Cairenes and tourists alike -- and it's no wonder. It's one of Cairo's few secluded outdoor spaces -- an oasis, housed in a 19th-century palace on the Nile. Menu options include freshly made pasta, pizzas, salads and traditional dishes, such as kebabs and kofta or ground meat. There's also a bakery inside the hotel that serves 14 types of bread, 28 French pastries and Movenpick, a terrific Swiss ice cream. It's pricey, though. Also on Zemalek Island, Sequoia is a sprawling lounge that will make you feel like you're among Cairo's fabulous. Sit in comfy chairs under the tentlike tarp, enjoying the breezes off the river while you eat sushi or smoke a shisha (water pipe). As befits a Muslim city, Cairo doesn't have a ton of places to drink alcohol, but this is one of them. Reservations are recommended, and there's a minimum charge. It's on Abu El Feda Street at the northern end of the island. Once the home of wealthy pashas, leafy Garden City is now the home to the American and British embassies, as well as top Western hotels -- which is why the neighborhood is surrounded by Egyptian security forces. Tell them that you're going to Taboula, a warm restaurant with Middle Eastern decor and Lebanese meze favorites, such as hummus, grape leaves, grilled cheese and baba ganoush. The restaurant, open noon to 1 a.m., is tucked away at 1 Latin American Street. For fantastic seafood and Middle Eastern salads, the moderately priced Americana Fish Market is as good as it gets. Diners choose from a large selection of freshly caught fish. Then choices are weighed, cooked to order and served with salads and aish, produced right out of the kiln. On top of that, the restaurant is located on the upper deck of a permanently moored boat on the Nile. The restaurant, open daily from 12:30 p.m. to 2 a.m., is located at 26 Sharia al Nil in Giza. Also in Giza, Khan El Khalili in the gorgeous Mena House Oberoi Hotel can't be beat for its breathtaking views of the Pyramids. It's open 24 hours and has a fantastic breakfast buffet. If you're in Giza around dinnertime, check out the hotel's popular Indian restaurant, The Moghul Room. Cairo has a well-established cafe culture; as you ride through the city, you'll see countless storefronts where men sit outside, having cups and smoking a shishas filled with flavored tobacco. One of the most famous, the El Fishawy, is in the bazaar. Note that few women smoke shisha in public; if you'd like to indulge, you're best buying a pipe at your hotel or at an expat-heavy restaurant, such as Taboula. For some travelers, Khan al Khalili may rival the Pyramids as a tourist destination. A one-time Turkish suuq that dates back to the Ottoman period, the Khan, as it is known, is a maze of alleys where all types of souvenirs are sold. Among the most popular are carpets, perfumes, belly-dancing costumes, spices, stationery, semiprecious stones, alabaster, brass and copper, and the sheesha water pipes that are a staple in Cairo's cafes. You'll also find galabeyas, the traditional robes worn by Egyptians, as well as gold and silver cartouche pendants, which can be customized with a person's name in hieroglyphic symbols. Buyer beware: The papyrus sold at the bazaar may look like the real thing, but don't fall for it. Most are knockoffs, manufactured from sugar cane or banana leaves. Also, bargaining is expected. As a general rule, offer half the asking price. In all likelihood, if you walk away, the vendor will call you back. All you need to know about the best time to go on a Nile River cruise, including Nile River cruise planning, Nile River itineraries, Nile River cruise tips and Nile River ports.